Almost everyone has heard of the Toba super-eruption, which took place on the island of Sumatra roughly 74,000 years ago, but the only evidence of tephra or tuff (volcanic fragments) from the eruption is in Asia, with nothing definite further afield. It has sometimes been thought that this huge eruption may have led to a volcanic winter, a period of at least several years of low temperatures following a large eruption. This is caused by the effect of enormous quantities of volcanic ash entering the atmosphere and reducing the sun’s penetration. Sulphides also help to reduce solar energy penetration and increase the Earth’s albedo (increasing the reflection of solar radiation and leading to cooler temperatures). In a 2013 study, Anders Svensson and colleagues suggest that a link has now been made between the onset of Greenland Interstadials (GI) 19 and 20 and Antarctic Isotope Maxima (AIM) 19 and 20 for the Toba eruption. Stadials are periods of low temperatures, lasting less than a thousand years, during the warmer periods between ice ages. Conversely, interstadials are warmer periods lasting up to ten thousand years, occurring during an ice age but not lasting long enough to qualify as interglacial periods. The GI periods and AIMs are numbered according to a scale based on Dansgaard-Oeschger events. These are relatively short-lived climate fluctuations, which occurred 25 times during the last glacial period (covering 110,000 to 12,000 years ago) and are used to help date events. The study’s claim is based on their matching of volcanic acidity spikes at both poles produced by increased sulphur compounds in the atmosphere following the Toba eruption, which have been matched to the existing dates based on Asian tephra records and the bipolar seesaw hypothesis. This hypothesis explains the thousand-year offset between temperature changes over the two poles during the last glacial period as being caused by a seesaw mechanism involving heat redistribution by the Atlantic Meridional Overturning Circulation (AMOC) system, whereby warm water moves north from southern waters, mixes with cooler water in Arctic regions, sinks, and returns south as deep bottom water. The fluctuations in temperature associated with Dansgaard-Oeschger events over a few decades are reflected in Greenland ice cores but Antarctic ice cores show a picture of slower changes over hundreds to thousands of years, running out of phase with the Greenland records. A direct link was made by Carlo Barbante and colleagues in a 2006 paper. They used methane records from a Northern Greenland ice core and oxygen isotope records from the Antarctic Dronning Maud Land ice core to show direct coupling between warm events in the Antarctic and the duration of cold events in Greenland indicating their probable common origin in a reduction in AMOC. An increase in freshwater entering the North Atlantic during warming would slow heat transport towards the north. This would lead to cooler surface air temperatures there and warmer temperatures in the southern waters and vice versa – taking several decades to pass from one hemisphere to the other, hence the name bipolar seesaw effect. When volcanic gases, especially sulphurous gases, travel round the world in the atmosphere they form aerosols, which are trapped with air in precipitation at the poles in the form of bubbles. The bubbles are entombed at the depth at which firn (a type of rock-hard snow that looks like wet sugar) is compacted into ice. Succeeding precipitation and compaction over thousands of years provides evidence of atmospheric composition at different times, in trapped air bubbles, which can be analysed in ice cores. But the ages of both ice and gases are offset by 100-1000 years, depending on factors such as thickness of the firn, temperature and the presence of impurities in the ice. Ice cores are a bit like tree rings in that their thickness and other properties reflect climatic conditions at the time and differences can be counted as annual rings for the younger cores, before compaction makes it impossible to distinguish them. 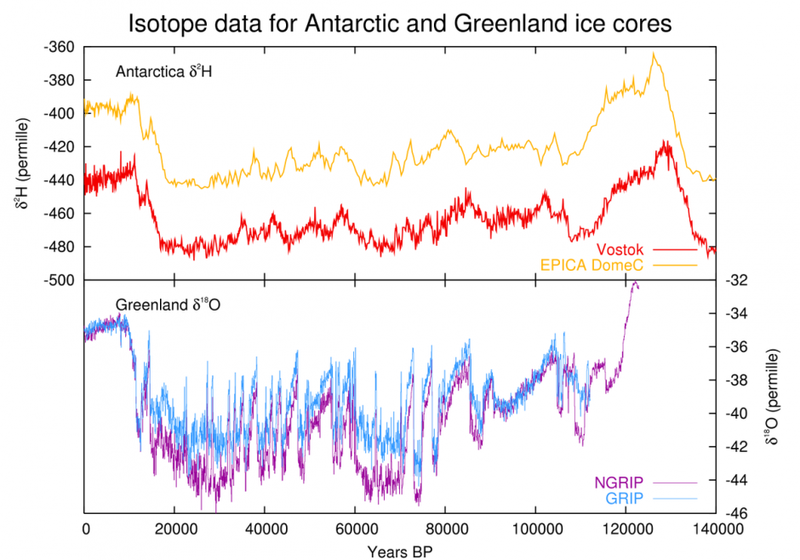 Oxygen isotope and atmospheric methane signals in ice cores were available to link two separate records (NGRIP and EDML) for the period covering 80-123 thousand years ago. Different gases can be used to date a particular part of an ice core and, as can be seen above, δ2H in Antarctica and δ18O in Greenland were used for dating purposes. 10Beryllium is found in the atmosphere and its levels change with solar activity and the Earth’s magnetic field. It is only found in the atmosphere for one or two years at a time so it can be used to help synchronise data from different ice cores more closely. A dating method using cosmogenic 10beryllium signals to match both Greenland and Antarctic ice cores to the Laschamp geomagnetic event (a short reversal of the Earth’s magnetic field). This helps pinpoint a particular date at around 41 thousand years ago, and provides a direct link between the ice-core horizons so that the data could be matched and signs of the eruption detected at the known eruption time. With markers for 41,000 and 80,000 years ago synchronised for the two polar regions, the ice cores were examined for signs of sulphate acidity spikes indicating a major eruption. The time scales were then combined for datasets from a number of ice cores (NGRIP, EDC, EDML and Vostok) to produce consistent scales for ice and gas records. From the Greenland (NGRIP) and Antarctic (EDML) ice-core data, evidence of the Toba eruption was synchronised between them for approximately 2000 years around the known eruption time, using a pattern of bipolar volcanic spikes and the Greenland Ice Core Chronology 2005 defined for the NGRIP annual layer count, to compare with Antarctic data. They found evidence of large quantities of atmospheric sulphates (usually linked to volcanic eruptions) in both sets of data in the form of acidity spikes and linked these to the Toba eruption. In fact, there are four bipolar acidity spikes within a few hundred years of the presumed Toba event, suggesting that there may have been several events, also confirmed by argon dating. Moreover, the authors found that the Toba eruption was linked to up to 4 acidity spikes occurring between 74.1 and 74.5 thousand years ago. These Toba events occurred at a time of rapid climate change from warm interstadial to cold stadial periods in Greenland and the equivalent Antarctic warming within 100 years, which perfectly agrees with the bipolar seesaw hypothesis. Interestingly, another more recent study, showed that Lake Prespa in southeast Europe reached it’s lowest recorded level, or lowstand, at the time of the Toba eruption. The timing of the lowstand is dated at 73.6 ± 7.7 thousand years ago based on Electron Spin Resonance dating of shells. This short-lived lowstand also coincides with the onset of Greenland Stadial GS-20, with a possible link to the Toba eruption. This new data and more accurate dating described in these studies, does tend to show that the Toba eruption (or series of eruptions) did, in fact have global impact. EPICA Community Members: One-to-One coupling of glacial climate variability in Greenland and Antarctica, Nature, 444, 195-198, doi. 10.1038/nature05301, 2006. Svensson, A., Bigler, M., Blunier, T., Clausen, H.B., Dahl-Jensen, D., Fischer, H., Fujita, S., Goto-Azuma, K., Johnsen, S.J., Kawamura, K., Kipfstuhl, S., Kohno, M., Perrenin, F., Popp, T., Rasmussen, S.O., Schwander, J., Seierstad, I., Severi, M., Steffensen, J.P., Udisti, R., Uemura, R., Vallelonga, P., Vinther, B.M., Wegner, A., Wilhelms, F. Winstrup, M.: Direct linking of Greenland and Antarctic ice cores at the Toba eruption (74 KaBP), Clim. Past, 9, 749-766, doi. 10.5194/cp-9-749-2013, 2013. Wagner, B., Leng, M.J., Wilke, T., Böhhm, A., Panagiotopoulos, K., Vogel, H., Lacey, J.H., Zanchetta, G., Sulpizio, R.: Distinct lake level lowstand in Lake Prespa (SE Europe) at the time of the 74 (75) ka Toba eruption, Clim. Past, 10, 261-267, doi.10.5194/cp-10-261-2014, 2014.